The upcoming mid-engine Corvette has been testing for quite some time now but there is still no word on its launch schedule. However, a new batch of spy videos suggests that a reveal is not too far now. 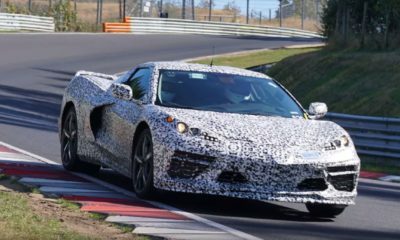 The C8 corvette was seen out and about on the Nurburgring, which generally means that the car is in its final phases of testing. It has shed the heavy dark cladding for a much lighter black and white camouflage. The bicolor decals hide what mostly looks like production bodywork. The spy photographers were able to catch the upcoming Corvette making some delicious maneuvers while being glued to the tarmac. Now, what is powering the mid-engine supercar is still a mystery. Rumors suggest there are three powertrains under consideration: The entry-level model will reportedly feature the current 6.2-liter V8 with 460 hp on tap, followed by the mid-range twin-turbo 4.2-liter V8 with 650 hp and a larger twin-turbo 5.5-liter V8 developing as much as 850 hp. As far as the transmission is concerned, a dual-clutch unit is likely to be offered. However, an updated version of the current eight-speed automatic and even the Camaro’s 10-speed ‘box cannot be ruled out. The Chevrolet Mid-engine Corvette could debut at the Detroit Motor Show in January 2019 allegedly wearing the “Zora” Moniker.